This Taiwanese turkey is screening as part of the Cine Asia programme from Vendetta Films. 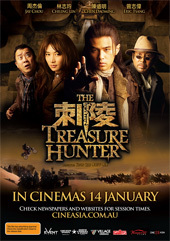 It claims to have been influenced by Pirates of the Caribbean and Indiana Jones. I have not seen Pirates but have a certain fondness for the fun of Indi. I think the fun factor in Hunter seems to have been lost in translation. Lead-man Jay Chou is being marketed as a conglomerate of talent. Here he plays a noble-souled antiquarian who must restore relics to their rightful owners from poachers (who are bad because they’re Russian, or is it vice versa?). He ends up in the Mongol deserts with his mentor’s daughter (who is an author of novels he does not respect) and a band of eccentrics in search for the wealth of the Lost City. Needless to say, numerous fight-scenes stand in their way. Some of the choreography is great and the ghost-horse chase is thrilling but that’s too little return on my 106 minute investment. Perhaps the only thing to be salvaged is the unintended funniness. Some of the dialogue comes across as super-cheesy and there’s awkwardness around the love-interest which lacks any credibility. There was also a peculiar duel with The Deadly Sheathes of Linen (my memory) which has to be seen to be believed! The only interesting thing comes at the end, where self-referencing hits you out of the blue (perhaps). All in all, it failed to spark my interest or capture my imagination. I didn’t care what these people were up to among the sand or why. The audience I saw it with was overwhelmingly Chinese and they seemed to be enjoying it, when not on their phone or bumping the back of chairs.